Martina Kudlacek, director of the critically acclaimed "In the Mirror of Maya Deren," brings us the story of Marie Menken (1909-1970), one of New York's outstanding underground filmmakers, who inspired and worked with renowned artists Andy Warhol, Stan Brakhage, Jonas Mekas, Kenneth Anger and Gerard Malanga, and became known as "the mother of the avant-garde." Originally an abstract painter and collage artist, Menken produced nearly two dozen experimental shorts, gracefully using a hand-held Bolex camera to create rhythmic patterns of light, color, form and texture, and compose exquisite visual poems. Rich in excerpts of Menken's work, the film also features the rare and fascinating footage of "The Duel of the Bolexes" she conducted with Andy Warhol on a New York rooftop. The large, loud and tempestuous Menken, whose volatile relationship with husband Willard Maas reportedly inspired Edward Albee's play Who's Afraid of Virginia Woolf, became a Warhol superstar making memorable appearances in The Life of Juanita Castro and The Chelsea Girls. Featuring interviews with Jonas Mekas, Kenneth Anger, Gerard Malanga, Peter Kubelka, Alfred Leslie, Billy Name, and the Chelsea Girls star Mary Woronov. NOTES ON MARIE MENKEN explores the nearly forgotten story of the legendary artist Marie Menken (1909 - 1970), who became one of New York's outstanding underground experimental filmmakers of the 1940s through the1960s, inspiring artists such as Stan Brakhage, Andy Warhol, Jonas Mekas, Kenneth Anger, and Gerard Malanga. Menken was probably the inspiration for the character "Martha" in Edward Albee's Who's Afraid of Virginia Woolf, and ended up as a Warhol Superstar. Menken was an abstract painter when she began to experiment with film. 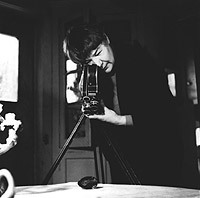 "Film making was a natural evolution while I was engaged in painting, particularly since I was primarily concerned in capturing light, its effect on textured surfaces, its glowing luminescence in the dark, the enhancement of juxtaposed color, persistence of vision and eye fatigue," Menken explains. 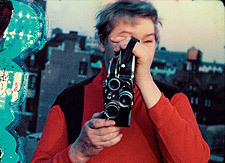 The filmmaker Jonas Mekas wrote, "Marie was one of the first filmmakers to improvise with a camera and edit while shooting. She filmed with her entire body, her entire nervous system. You can feel Marie behind every image, how she constructed the film in tiny pieces and through the movement. The movement and the rhythm—it is this that so many of us seized upon and have developed further in our own work. … And she gave us a new beginning. She took the film - the non-narrative film, the poetic film, the language of film - in a completely new direction, away from classic filmmaking and into a new adventure." 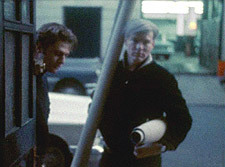 The film presents never-before-seen footage by Marie Menken salvaged from basements and storage vaults, including a camera "duel" for Bolexes between Menken and Andy Warhol. New York composer and musician John Zorn contributes a wonderful film score for this revealing documentary, which allows a glimpse into Menken's social and artistic struggle.